TwistDx’s proprietary technology, RPA (Recombinase Polymerase Amplification), represents a complete revolution in DNA diagnostics, combining superiority in speed, portability and accessibility with exquisite sensitivity and specificity compared to other diagnostic testing systems now on the market. It is usable in nearly any setting, eliminating the need for a trained technician or laboratory environment. TwistDx’s RPA process employs enzymes, known as recombinases, which are capable of pairing oligonucleotide primers with homologous sequence in duplex DNA. Through this method, DNA synthesis is directed to defined points in a sample DNA. If the target sequence is indeed present, DNA amplification reaction is initiated; no other sample manipulation such as thermal or chemical melting is required. The reaction progresses rapidly and results in specific DNA amplification from just a few target copies to detectable levels typically within 5 - 10 minutes. The entire reaction system is stable as a dried formulation and can be transported safely without refrigeration. RPA can be used to replace PCR (Polymerase Chain Reaction) in a variety of laboratory applications and end-users can design their own ultra-sensitive assays without the need for a thermocycler, and unlike most isothermals, RPA really works easily out of the box with a pair of primers! 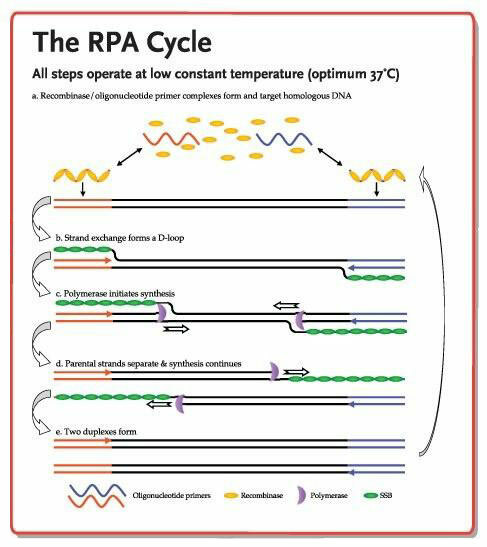 RPA operates at low, constant temperatures and does not require initial melting of the sample DNA (optimal temperature 37°C); in fact, body heat can support the process if necessary. It is also fully robust in the face of off-temperature and low temperature set-up. At typical ambient temperatures (25°C) the process works, albeit more slowly, and results can still be obtained within an hour with the biochemistry appropriately configured . N.B. Standard TwistAmp® kits are not configured to function below 37°C. We anticipate supplying completely disposable tests in the near future. RPA has been shown to function directly on sample material that has not undergone a “traditional” nucleic acid purification procedure, such as for example the Boom method. RPA compatible template has been successfully prepared from a number of sources, including blood, nasal swabs and culture media, by simple pathogen lysis methods (such as weak alkali or heat treatment) and without further isolation and purification of the nucleic acid material. The best approach has to be specifically defined for each type of application and is dependent by factors such as pathogen titre, presence of inhibitors and lysis requirements. The robustness to complex sample matrices make RPA potentially very well suited for field use and point-of-care applications. RPA is capable of amplifying from a few molecules to detectable levels in 5 - 10 minutes (at around 37°C). Combining this performance with simple rapid sample preparation and decentralised point-of-use, RPA enables diagnosis within a half-hour or less compared to the 24-hour turnarounds currently typical for clinical samples requiring analysis at centralised facilities. RPA can detect single copies of DNA and tens of copies of RNA (or less). RPA is so specific that it can operate easily to single molecule levels in the presence of hundreds of nanograms of unrelated complex genomic DNA, such as that from plants and mammals. This permits the detection of trace levels of targets even in extremely complex nucleic acid samples. RPA can be readily applied to any DNA or RNA target. Ultra-high sensitivity RNA detection is possible in a one-pot system if reverse transcriptase is included. Several different potential targets may be detected with a single RPA test as multiple detection primers can be combined in one tube. Minimal or no device requirements mean that a broad range of end users can operate our products compared with other more exclusive, capital-intensive diagnostic products on the market. The reaction system is provided in a stabilised dried format which may permit transportation and limited storage without refrigeration (long term storage under refrigeration is still recommended). We offer a range of specific systems and instrumentation including fluorescence, real time probes and sandwich assay formats.